Hope you guys have been great last couple of weeks! 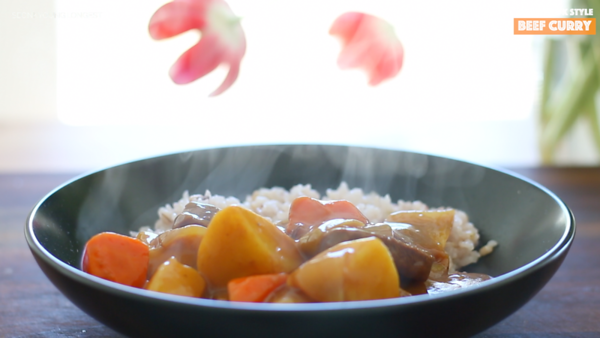 I brought a very simple beef curry recipe today, it is one of my go-to dish when I have no idea what I want to cook or eat! 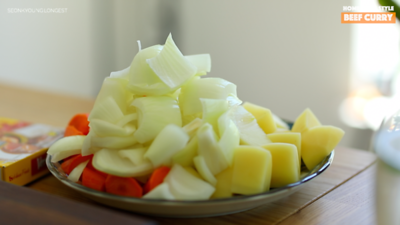 The ingredients are simple, cooking method is easy yet the taste is very delicious… can’t ask more! 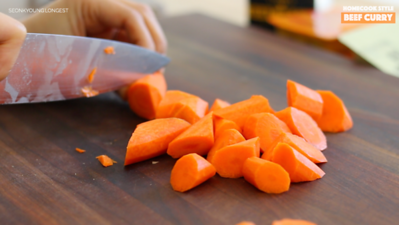 Peel potato, carrot and onion then cut into large chunks. 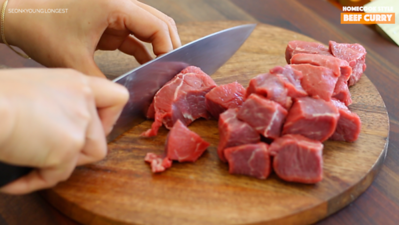 Cut beef into same size as the vegetables. 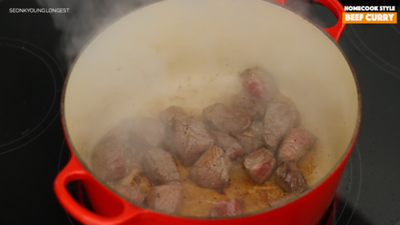 Heat a large pot over hight heat and add cooking oil. 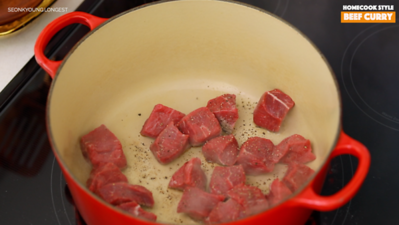 Add the beef and season with salt and pepper. Sear the beef all sides, about 2 to 3 minutes. Add the vegetables and sauté for 2 to 3 minutes. Add the water and stir well. 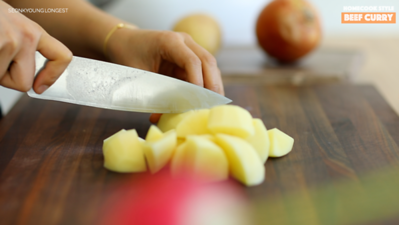 Bring it to boil and hard boil for 6 to 8 minutes or until the potato is fully cooked. Skim the scums as needed. 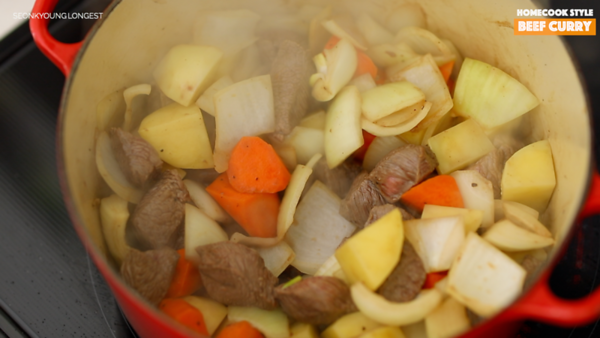 Add Japanese curry blocks and reduce heat to medium low. Stir well until the curry blocks are completely dissolved. 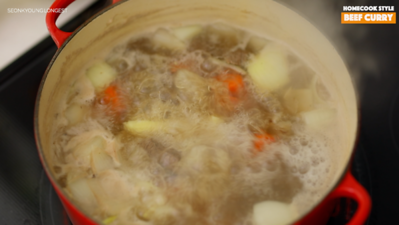 Simmer for 1 more minute and it’s ready to serve! 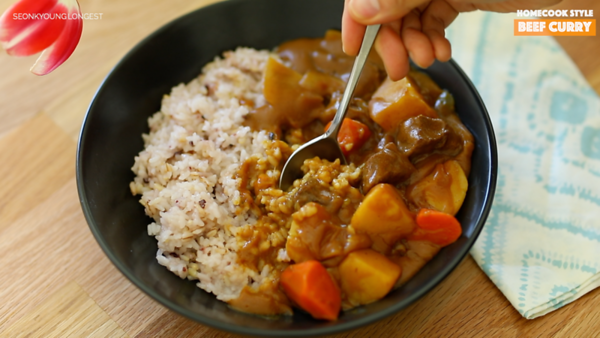 Above is the Japanese curry I used in this video, Vermont Curry. I usually like to mix mild and hot but it’s up to you! You will need 1 and 1/2 box for this recipe! Serve with warm cooked rice is classic, fried or poached egg is an optional to your taste! Add the vegetables and sauté for 2 to 3 minutes. Add the water and stir well. 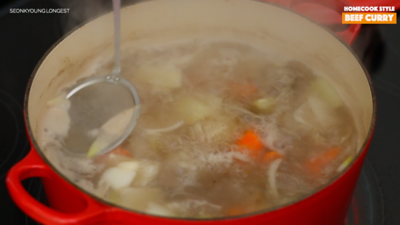 Bring it to boil and hard boil for 6 to 8 minutes or until the potato is fully cooked. Skim the scums as needed. Add curry blocks and reduce heat to medium low. 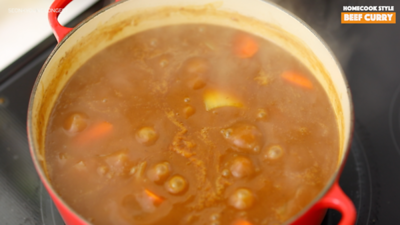 Stir well until the curry blocks are completely dissolved. Simmer for 1 more minute and it’s ready to serve! Serve with warm cooked rice is classic, fried or poached egg is an optional to your taste! Enjoy!